More than seven years on from the financial crisis, a new sustainable British growth model has yet to emerge, whilst the Conservative Party have been successful in rebuilding the pre-crisis growth model which failed so spectacularly in 2008. 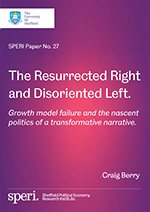 In his significant new SPERI paper – The Resurrected Right and Disoriented Left – Craig Berry, the Deputy Director of SPERI, explores the political economy of growth model transformation in Britain, analyses the political narratives offered by the British centre-left since the crisis, and argues that none have so far offered an effective transformative alternative. Craig’s paper sets out how value, place and equality have emerged as three of the major pillars of post-crisis discourse in British politics, upon which the Conservative Party has effectively founded its key policy agendas since 2010. He powerfully argues that the left must also tap into the sentiments expressed in those pillars if a transformative growth model is to be constructed. Craig’s paper is complemented by a set of excellent responses from five leading thinkers from the worlds of politics, policy and academia: Martin Craig, Research Associate at SPERI; Tony Greenham, Director of Economy, Enterprise and Manufacturing at the RSA; Rachel Laurence, Senior Co-ordinator of the New Economy in Practice team at the New Economics Foundation; Adam Leaver, Professor in Financialization and Business Analysis at Manchester Business School, and Stewart Wood, a Labour peer and former adviser to Gordon Brown and Ed Miliband.